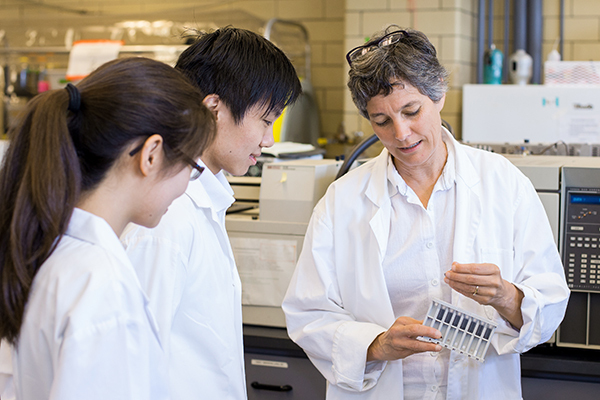 U of T Engineering professor Elizabeth Edwards (ChemE) is internationally recognized for using biotechnology to clean up industrial solvents in soil and groundwater. Her technique earned her the prestigious Killam Prize in 2016 and has already been used to restore more than 500 sites around the world. One way to decontaminate industrial sites involves digging up the soil, but this costly technique is impractical once solvents have seeped into groundwater. At some sites, Edwards noticed that anaerobic microbes — bacteria that live without oxygen — were breaking down the solvents naturally. But no one understood how. After sequencing their DNA, Edwards discovered that different microbe species collaborate to break solvents down in stages. She and her colleagues grew a culture of these microbes, pumped them into contaminated groundwater and proved they could clean it up inexpensively, effectively and safely. These invisible allies can also be used to create biodegradable plastics and even capture energy from waste. As Edwards says, we’ve only just begun exploring “the enormous, untapped potential of anaerobic microbes.” She sat down with writer Tyler Irving to discuss her research. Can you briefly describe the problem you’re trying to solve? As careful as humans try to be, every industrial site — whether it’s an oil refinery or a dry-cleaning facility — has contamination from pollutants that have leaked onto the ground. These pollutants can affect not only the site itself, but also groundwater that travels through the soil. In the past, people were not as aware of the risks of these chemicals, so there is a legacy of thousands of contaminated sites around the world. Industry and government have a responsibility to clean them up so they can be used for other purposes. How does your research help clean up contaminated sites? We started by just looking at the natural processes that affect the contaminants over time. It turns out that most of them do slowly transform, as a result of action by various microorganisms living in the soil or water. One way to speed up this process is to add oxygen, either by pumping air into the ground or digging up the underlying earth. That does encourage the growth of certain toxin-degrading microbes, but it takes a lot of energy. Our work focuses on anaerobes — organisms for whom oxygen is poison — that do wonderful biochemistry and actually degrade these harmful compounds without the need to dig up or aerate the earth. Relatives of these organisms exist everywhere, but a given industrial site might not have just the right ones for the compounds they are dealing with. In our lab, we start with soil or water from contaminated sites, and grow enriched cultures of the anaerobic microbes that live there. By selecting the best performers over many generations, we create enriched cultures that are very good at degrading specific pollutants. We can then add these cultures back to the contaminated sites and speed up the natural degradation process. This is called bioaugmentation. How did you commercialize your work? I worked for an engineering consulting company for three years after finishing my PhD. I made a network of friends and colleagues in that community, and we continued to work together when I became a professor at U of T.
Consultants are the ones working with companies on clean-up, so they had access to the sites I needed to study. They could also tell us whether what we were doing in the lab was relevant to the problems they were dealing with. And when we finally sniffed something interesting — when we found a culture that seemed to be good at degrading these compounds — they were there to help turn it into a business. In 2001, we founded SiREM, an environmental engineering consulting company. They grow and distribute our bioaugmentation cultures, as well as providing testing, monitoring and all the other services needed to clean up these sites. What’s next for your lab? Our earlier microbial cultures focused mostly on chlorinated solvents, which are chemicals used primarily in dry cleaning and industrial degreasing. Over the years, we have also developed anaerobic cultures that can degrade benzene, toluene, ethylbenzene and xylene — collectively known as BTEX — which are often found in sites contaminated by oil and gas. We have finally figured out who are the most critical members of these microbial communities. Because their numbers are often low at contaminated sites, we are working with SiREM to grow up large quantities of these cultures and test them in the field to boost numbers and accelerate degradation rates. If it works, it will greatly expand the number of sites we can treat. We also study the organisms that grow in anaerobic digesters. These are large facilities which process organic waste from farms or cities and turn it into methane, which is then burned to generate heat and electricity. It turns out that many of the same organisms we studied in groundwater and soil also exist in these anaerobic digesters. If we can help that process work even better, we can generate lots of renewable, clean energy. Why did you choose to be a professor at U of T? When I was working in industry, I missed the interactions with students and constant streaming of new ideas and buzz that happens at a university. I missed going to seminars, but most of all I really missed doing lab work — I wanted to test stuff out for myself, not just read papers others had published. My boss in consulting, Dr. David Major, realized that I was wishing for a lab of my own and encouraged me to apply to academic positions. I began my career at McMaster, then joined U of T in 1997. What began as a series of informal collaborations with colleagues both inside and outside the university eventually grew into BioZone, a multidisciplinary centre that focuses on applied work at the intersection of biology and engineering, from idea to commercialization. We now have a critical mass of equipment, tools and institutional knowledge in this area, which ensures that we don’t have to re-invent the wheel every time we gain a new student. Instead we have this collaborative, friendly atmosphere where we talk about the things that don’t work, and try to solve difficult problems together. Our researchers are limited only by their imagination.